John Flucke's Blog - Ramblings of Dentistry's Technology Evangelist: Should You Floss Before or After You Brush Your Teeth? For years the debate has raged back and forth over whether it's better to floss before you brush or afterwards. Now Self magazine has the answer... or at least they've weighed in with an opinion from a dentist. Personally, I've always advocated before. 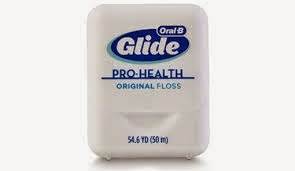 My logic has been that flossing gets plaque & debris out from in between your teeth, but it's still there... somewhere. Brushing then helps remove the material completely and then you spit it all in the sink. It's not a question of if you should floss, but a matter of when. And correctly timing the daily habit can have a major impact on your dental health—here's what the experts have to say in SELF's March issue. Floss before you brush—it loosens the food and plaque between teeth and under gums, so brushing can sweep them away, says Matthew Nejad, D.D.S., a dentist in private practice in Beverly Hills, California, and faculty member at the University of Southern California Ostrow School of Dentistry. Of course any flossing is better than none (your toothbrush can’t access the tight spaces between your teeth and in gums), but waiting until after brushing allows particles to settle back into the teeth. Getting rid of them is key to prevent cavities, bad breath and gum disease. The American Dental Association recommends flossing at least once per day. (Extra credit if you floss every time you brush.) To remind yourself, stash floss by your toothbrush, where you’ll see it. The extra 30 seconds it adds to your morning and evening routine will be well worth it.